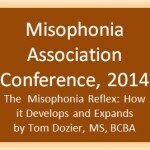 Tom Dozier gave this presentation at the 2014 Misophonia Association Conference, held in Orlando Florida. He gave this talk from his office (via the internet) because he was unable to attend in person. Tom presents a bold finding from his work with misophonia patients. He announced that the core of misophonia is a physical reflex to the trigger sound. If he is correct, this has major implications for research and treatment of misophonia. 1. Misophonia is generally viewed as an involuntary emotional response (a reflex) to trigger stimuli. 2. 95% of people with misophonia have a hidden reflex response to the trigger stimulus. 3. The trigger elicits (jerks out of you) the physical reflex. The physical response elicits the extreme emotions. 4. If you can stop the physical reflex, then the extreme emotions do not occur (no misophonia reaction). 5. Misophonia develops when a person is in a state of distress and hears a repeating sound. 6. Misophonia probably continues because of the extreme emotion the trigger produces. 7. Ways to reduce the emotional reaction and eliminate triggers are presented.